Ms. Gaya Paungan is going to Acsenda! - Gateway to Canada | Canada Immigration Consultancy! Ms. Gaya Paungan is going to Acsenda! There are more than 60 pathways to get a permanent resident status in Canada. Eligibility, requirements, process and costs varies. You need to figure out which pathway is applicable, practical and suitable for you. 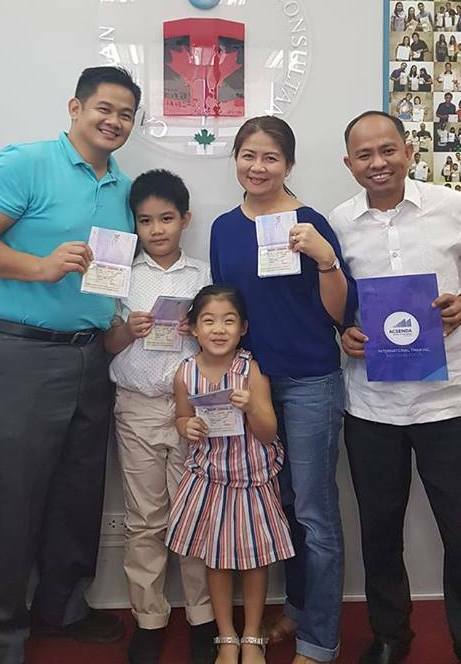 Ms. Ligaya Paungan will be studying in Canada as International Student while her husband, an IT Professional, will be working full time. Their kids will be studying there for free! "This is to thank everyone at Gateway to Canada. All are friendly and accommodating. Special thanks to Apol, Irene and JD Specialist. You had helped us to think positively. You never stopped from giving us options to take until we finally came up with a right decision. Your clients would love you, guys! More power!!" Information about visa application to Canada is available for FREE at http://www.canada.ca. Interested to study, work and live in Canada? Take our FREE Online Assessment and learn your options. You can bank on Canadian Immigration Consultancy's over 25 years of experience and become one of the thousands of clients we've already sent to Canada.